A few weeks ago I wrote that Scotland is very different from the rest of the UK in terms of its railways. Well, so is Wales, which is embarking on a unique franchising process on which a lot rests, perhaps, indeed, the very fate of the Welsh government. It is different because of devolution and the way that the franchise has been structured, but also because of the high stakes involved for local politicians. While the English media ignores totally what is happening on the railways Wales, the Welsh covers every grisly detail of a franchise process that is immensely complicated and which faces the risk of descending into total chaos unless there is very careful handling from the politicians. The history of franchising in Wales is not a happy one. 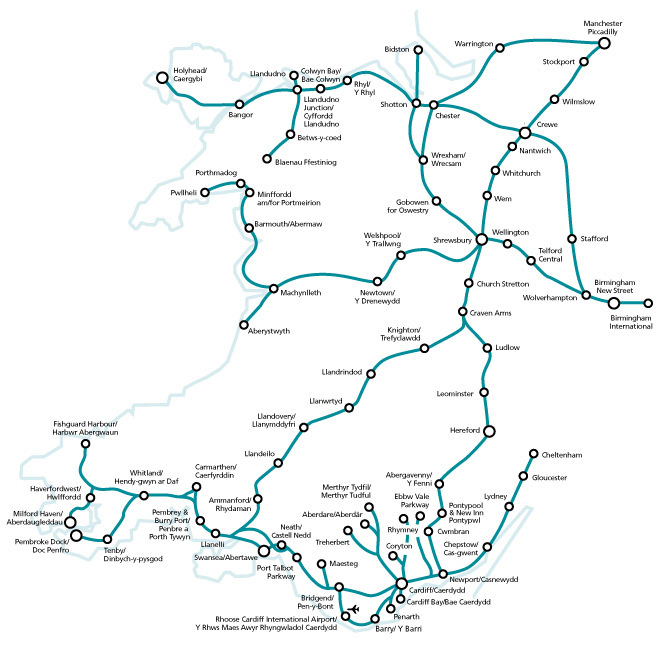 In 2003, Arriva was granted a 15 year franchise to run the Wales and Borders contract and it was very much a plain vanilla deal. There were few baubles for passengers and the expectation was that the growth spurt in passenger numbers at the time would fizzle out, especially in rural areas. As we know now, the opposite happened and there has been virtually unfettered growth in Wales, as with the rest of the UK network. Therefore because of the lack of capacity as a result of the low growth expectations, while passenger numbers have soared, satisfaction has dropped. Indeed, the latest figures from the National Rail Passenger Survey show a further 3 per cent reduction in satisfaction, bringing the overall score to below 80 percent, near the bottom of the league table, because of unreliability and, especially, overcrowding. The Welsh government, keen to improve rail services, launched an ambitious franchise process that involved what was termed a ‘competitive dialogue’ (which I wrote about in Rail 813). Rather than specifying precisely what was needed, especially in relation to the Cardiff Valleys lines, the government asked bidders to put forward plans on how to improve the infrastructure and therefore they were required to have an engineering company as a partner. Now, though, it gets complicated in two ways. First, originally there were four bidders who qualified and that was considered fine. However, there is a risk that only two will be left standing. First, Arriva, the incumbent, made history by being the first holder of a franchise to throw the towel in as the company withdrew its bid with little explanation. The more Machiavellian thinkers in Wales reckon that Arriva’s withdrawal may be in the expectation that the whole process will collapse which means that the Welsh government would be forced to give it an extension. In fact, Arriva might have been bowing to the inevitable given that it might have been politically impossible for the Welsh politicians to have sanctioned its continued tenure. Indeed, Arriva’s departure has been widely welcomed as its reputation is at rock bottom after 14 years of doing very little to improve services, while making handsome profits. For most of the franchise, the company refused to put on extra services or, in particular, find additional rolling stock to reduce overcrowding and it has not escaped the notice of the eagle-eyed Welsh press that the company has meanwhile increased its profits from £6m annually to £20m, and built up a nice little next egg of a reported £70m. The fact that the franchise contract did not anticipate much growth and therefore made it difficult for Arriva to provide any additional capacity easily has elicited little sympathy from the travelling public who just see a poor service provided by a company happily filling its coffers. Then there is the possibility that Abellio’s bid will also have to be withdrawn. The Dutch railway company had the bad luck of choosing Carillion as its partner. Its bid, therefore, is in jeopardy because it is not simply a matter of finding another partner since the engineering company was an integral part of the bid. Therefore, four may have turned into two – Keolis with Amey and MTR with Bam-Nuttall – and one more mishap and the whole process will likely have to be rerun. As one insider put it, ‘Finding an engineering partner is not like going to Checkatrade for the local plumber’. The concept of competitive dialogue is a good one. The bidders have come up with innovative plans to improve the Cardiff Valleys lines, with light rail being the favoured option – though there are issues about sharing the line with the remaining freight services. Electrification would, of course, be required and here there is the further complication that it was the European Union that was going to fund the improvement which makes the Welsh people’s decision to vote for Brexit all the more baffling. It is no exaggeration to say that the very fate of the Welsh government rests on the future of the franchise. If it all goes pear-shaped, it will be a very big story in Wales and may well affect the stability of the government whose political make up is on a knife edge with Labour holding just 29 out of the 60 seats and dependent on the sole LibDem for control. It is not often that railways determine elections, but in Wales this is quite likely to be the case, though the Assembly is not up for re-election until 2021. Regular readers will know that I have always been, to put it mildly, rather sceptical of claims made for HS2. One of those, which I have often questioned, is the prediction that HS2 will improve the imbalance between the north and south, bringing growth to the regions it serves. A supporter of HS2, reader Michael Bell, has now scored what he fully admits is an own goal by uncovering a nasty bit of subterfuge from the government on this precise issue. In the original prospectus for the line published in 2009, a graph purported to show that towns and cities more easily reached from London had a higher growth rate than those that did not. Consequently Torbay, Middlesbrough and Plymouth performed badly compared with Luton, Peterborough and Reading. As I have mentioned previously, Professor John Tomaney has questioned this analysis (see Rail 735) arguing that the benefits of better connection accrue to the stronger of the two towns, which of course would be London. Now Mr Bell has added further doubt to the analysis by showing that the towns selected for the graph were not selected randomly but were chosen to back the case for HS2 and that the graph (figure 3.2) was misleading by showing a trend line that did not reflect the data i.e. it was just randomly drawn. He wrote to the Office of National Statistics for an assessment of the claim and it seems they were not impressed. They told him ‘Having looked at the material you shared with us, we would agree that there does appear to have been some selectivity in the choice of areas presented. We note that travel time to London is just one factor among many that might determine a region’s GVA [Gross Value Added], and that GVA is only one measure of income’. Indeed, the paper itself admitted that there are many other factors that determine economic performance other than travel distance to London, such as the relative better performance of Swindon compared with Southend, and therefore there is no certainty that improving journey times will result in faster growth. Yet, HS2, with its enormous budget is still being sold as the solution to the North South divide. My answer to this has always been – create a Network SouthEast for the North with fast, electric, modern trains linking all the northern cities on regular timetables. This could be achieved by a fraction of the cost of HS2 and would be hugely more beneficial. It would be great if the mostly Labour Northern MPs got behind that concept instead of failing to look behind the smokescreen that is HS2.